This report is based on the core hypothesis that heightened workforce participation by women can usher in the dual benefits of spurring India’s economic growth and strengthening socioeconomic empowerment of women. With this backdrop, the report contrasts the low and declining levels of women workforce participation in the country and highlights the complex interplay of socioeconomic barriers and challenges that contribute to this phenomenon. The report thereafter, deep dives into the specific challenges associated with lack of access to quality childcare and examines how convenient and affordable access to childcare can help women transition from unpaid labor to paid employment and in turn, socioeconomic empowerment. The report takes stock of the current state of the childcare ecosystem in India and attempts to leverage the latent market opportunity. 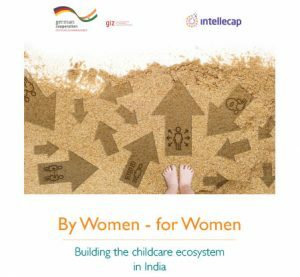 The report concludes by articulating recommendations for implementing an integrated three-pronged approach that combines building the required policy, skilling and entrepreneurship ecosystems for childcare. This report will be a valuable resource for a range of ecosystem stakeholders including regulatory agencies and government policymakers, development agencies, foundations, private sector companies in the capacity of employers, incubators and accelerators. It is expected to inform policy formulation and intervention design targeted at strengthening the childcare ecosystem in India.